Life for people who blazed the trail on the American frontier was rarely luxurious, or even remotely comfortable, when you consider the brutal weather conditions, scarce food supply, and nasty diseases that often plagued their travels westward. 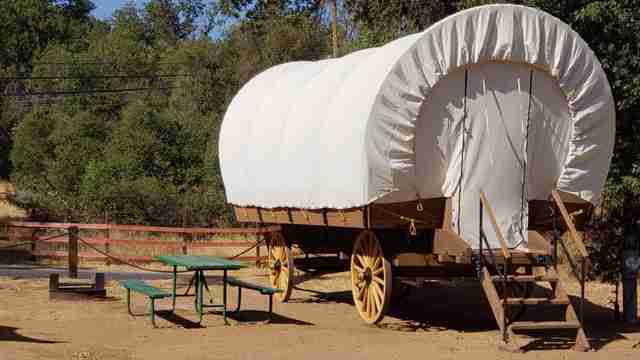 Still, there's something kind of charming and appealing about the prospect of living in an Oregon Trail-esque covered wagon (as long as you're not in there worrying about your precious ox or dying of cholera). 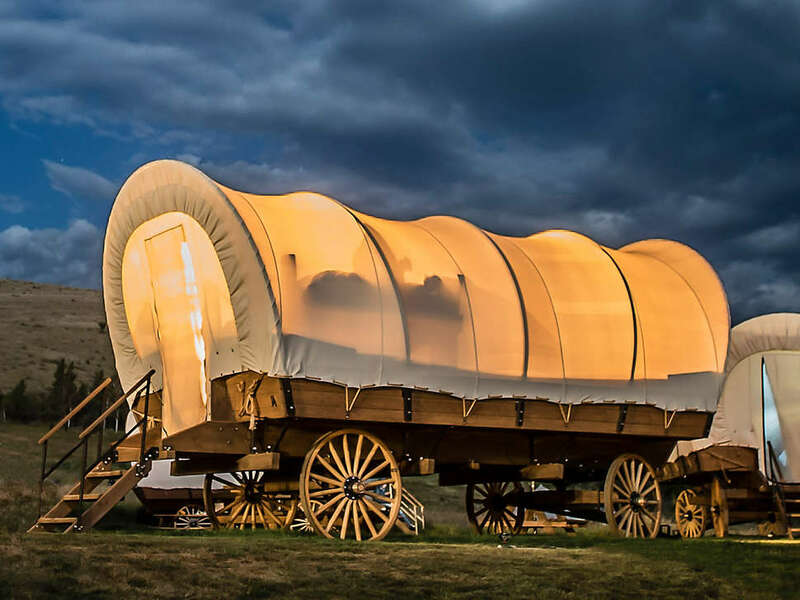 And if you've ever felt like channeling the pioneer experience, now's your chance, by soaking up some nature overnight in one of these new fully-outfitted, authentic Conestoga covered wagons right near Yosemite National Park. 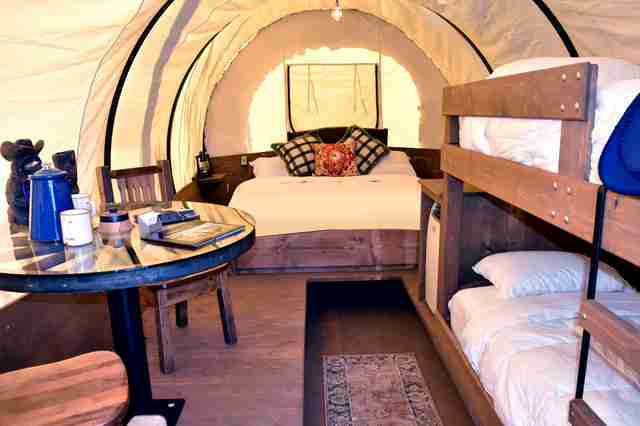 The wagons, which are available to rent at Yosemite Pines RV Resort and Family Lodging near the wildly popular National Park in California, are essentially decked-out rustic tents on wheels. They look just like the ox-pulled covered carts you remember from the 8-bit Oregon Trail you may have played in elementary school, except they're outfitted with modern-day amenities, and your chances of contracting yellow fever are significantly lower. Each one sleeps between four and six people, and is big enough to fit a king-sized bed, bunk beds, and even a small dining area. You aren't at the mercy of the elements, either, since they're equipped with heat and air conditioning, as well as a microwave, refrigerator, and even a Keurig coffee maker. There are six wagons on the premises, each set up with its own outdoor chill zone complete with a picnic table and grill. And while they're not entirely off the grid (they share the campground with other retro trailers and RVs), you're properly crashing in the country, surrounded by wildlife and trees. There's even a community swimming pool and volleyball courts on-site, which may not be authentic to the pioneer era, but hey, neither is penicillin. If you're interested, rates run between $139 and $279 a night, depending on the season. The resort also offers a number of other "glamping" options as well, if a more conventional overnight accommodation is more your speed. Just hit their website to scope out the range of options, or book your big ol' pioneer fantasy.